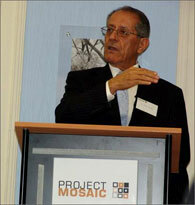 The Project Mosaic Lecture Series provides talks by experts aimed at promoting greater understanding amongst people from different cultures, races, religions and backgrounds, and countering prejudice and extremism. 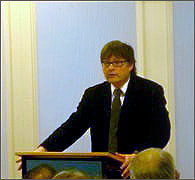 Lectures are presented to large audiences, while Roundtable Discussions are held for small groups. Anti-Semitism and Islamophobia: Moving Beyond Old and New Hatreds After 9/11 By Anthony Julius and Fiyaz Mughal OBE. Descended from Abraham: Exploring the Common Heritage of Jews, Christians and Muslims By Dr Ed Kessler, Director of the Woolf Institute. The Middle East in My Backyard: A Roundtable Discussion of Grassroots Change. Led by Mohammed Fahili, Director of the Jewish-Arab Community Center in Acre, Israel.